Titanic. You’ve heard the stories, watched the movies, and know the basics of the story of that great ocean liner that sank on 15 April 1912, with the loss of more than 1,500 people. Even with all the information that is available about this historical tragedy, there’s even more to be discovered. Photo: RMS Titanic departing Southampton on 10 April 1912. Credit: F.G.O. Stuart; Wikimedia Commons. For example, did you know that some people believed one man predicted the tragedy 14 years prior to the sinking? 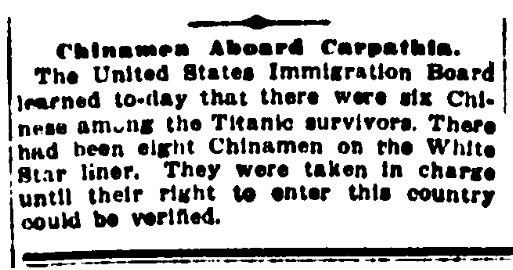 That there were six Chinese men who survived the sinking – only to virtually disappear once they arrived in the United States? 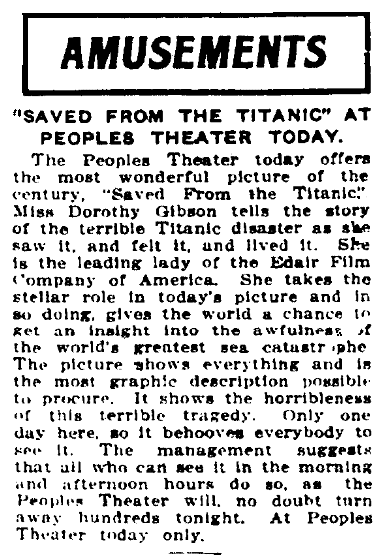 Or that the first movie about the Titanic was released the month after the sinking and starred one of the survivors? Those are just three facts not commonly known about the Titanic, as we’ll explore in this article. A large unsinkable ship sets sail in April. About 400 nautical miles from Newfoundland it hits an iceberg on its starboard side. Because it is carrying the bare minimum number of lifeboats, the loss of life is great. Sound familiar? 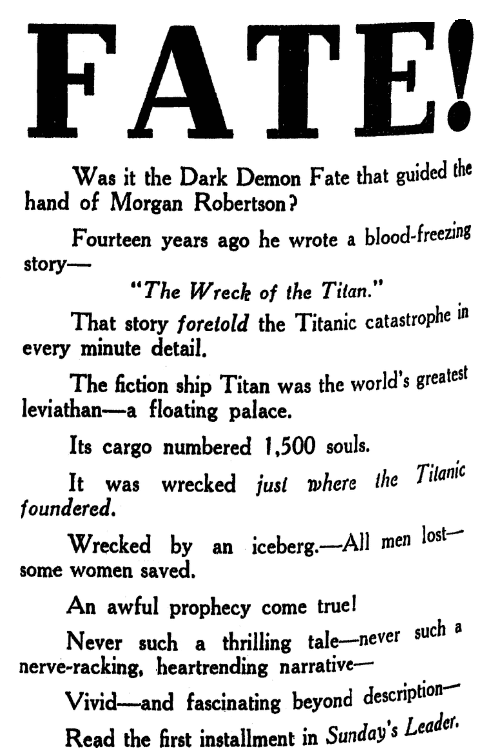 Author Morgan Robertson detailed that fictional account of a tragedy that befell a passenger ship in his 1898 novel Futility, later renamed The Wreck of the Titan, or Futility. There’s no doubt that Robertson’s story shares similarities with the real-life tragedy of the Titanic, but his ship Titan’s sinking is just one aspect of an overall story that details the life of a disgraced, alcoholic U.S. Navy officer who eventually turns his life around. 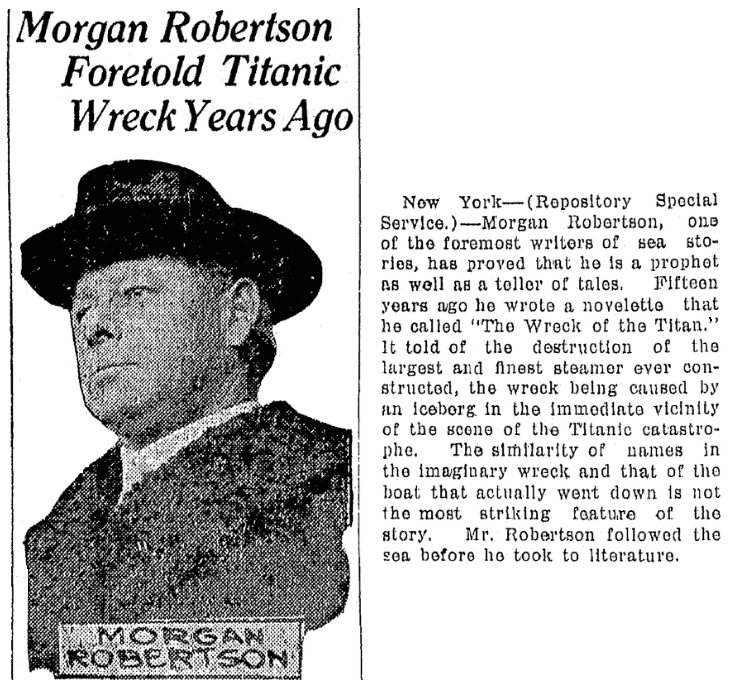 (1) Almost immediately after Titanic’s sinking, newspapers serialized Robertson’s fictional account to show the remarkable similarities. Was Morgan Robertson able to see the future? Some believe that he predicted not only the Titanic disaster but also World War II with his short story, “Beyond the Spectrum,” that describes a war between the U.S. and Japan in which Japan plans a sneak attack on the West Coast city of San Francisco. 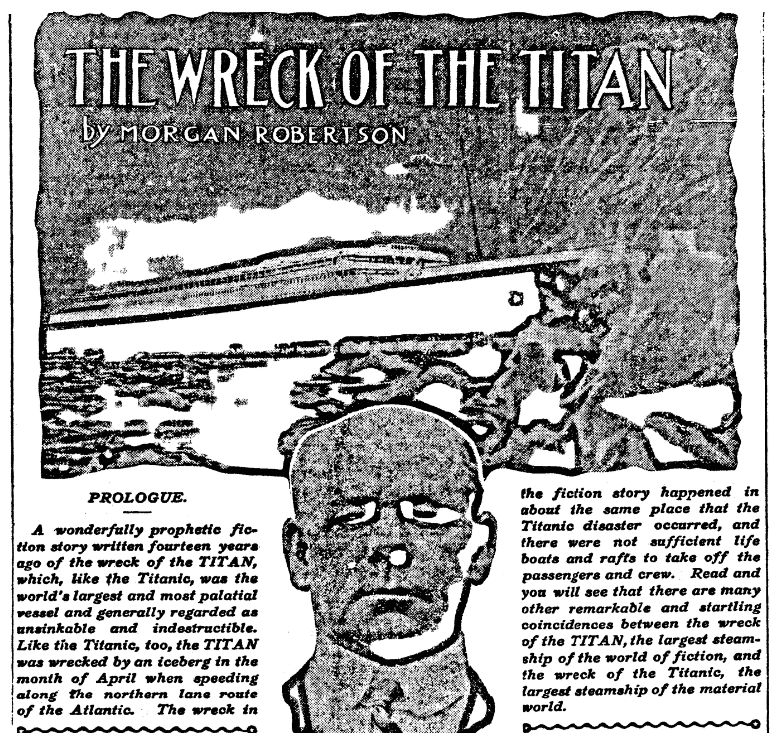 While it’s interesting to compare the similarities between Robertson’s Titan and the real-life Titanic, it’s important to know that Robertson worked in the merchant service and after 30 years at sea he turned to writing stories about the sea. He knew passenger ship trends and used that knowledge to write his novel about the Titan. It’s just a coincidence that portions of his story match the details of the Titanic tragedy. You can read Futility as well as “Beyond the Spectrum” in a collection of Robertson’s stories for free on Google Books. It’s easy to make assumptions about who was on the Titanic. We hear a lot about the wealthy passengers, or about those who held 3rd-class tickets. The assumption is that the passengers were white Europeans or Americans sailing from or to home. Not as well known is that there were eight Chinese men and one Japanese man sailing on the Titanic. All but two of the Chinese men survived the sinking. So why are their stories not as well known? Hosono and the Chinese men who survived the sinking were not alone in the ridicule that they suffered as male survivors. They, along with other men, were falsely accused of acquiring a seat on a lifeboat because they dressed as women. In addition, they also had the extra pressure of the racism of the time. 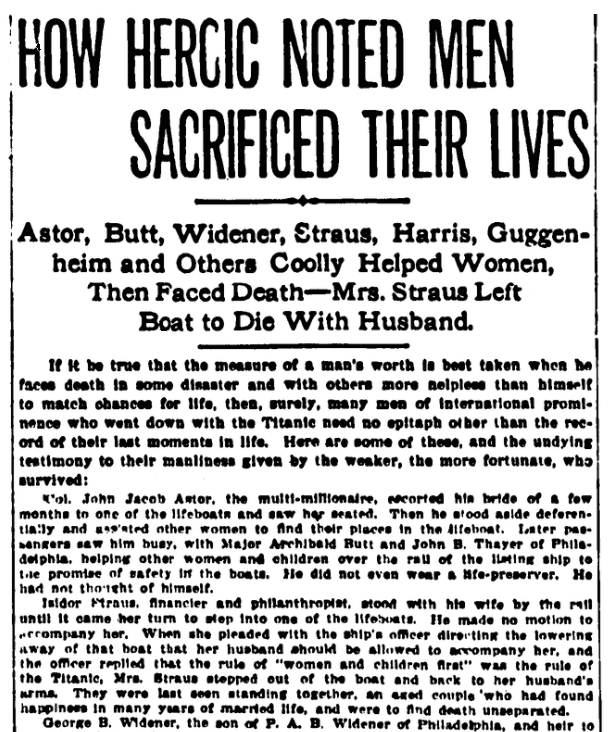 The message to these and other men was very clear: heroic men sacrifice and die to save women and children. In the case of the Chinese passengers, a documentary titled “The Six” seeks to tell their story. 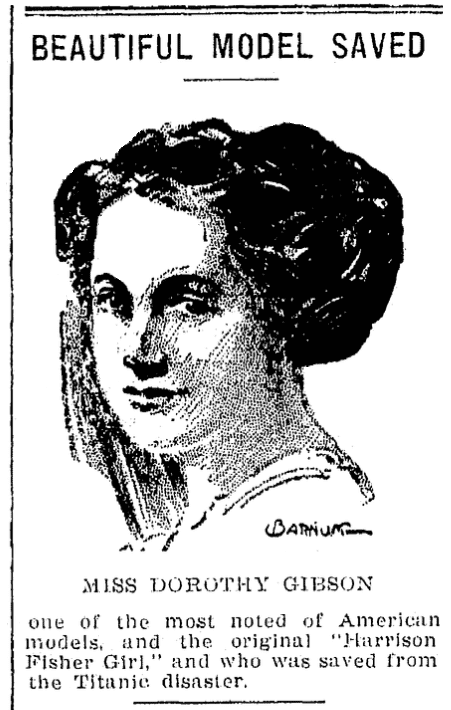 Dorothy Winifred Gibson was a 22-year-old American actress traveling with her mother, Pauline Gibson, on the Titanic. Returning from an Italian vacation, the first-class passengers were looking to get back to the United States so that Dorothy could start work in a series of movies for the American branch of a French film company. Dorothy and her mother had traveled to Europe for a vacation after she had starred in a variety of comedies and dramas for the company. Saved from the Titanic was Dorothy’s last film, as she decided to pursue a singing career. Her life after the Titanic did not get any easier. A year later she was driving her lover Jules Brulatour’s car when she struck and killed a passenger. She and Jules were involved in a six-year-long affair, and after he finally divorced his wife they married – but the union was dissolved two years later. Dorothy then decided to move to Europe and lived in Italy during World War II, where she was arrested for anti-Fascist agitation and spent time in prison, which she eventually escaped. Dorothy died in 1946 in France from a heart attack at the age of 56. Her last film, Saved from the Titanic, has been lost. There is still more to discover about that night on 15 April 1912. 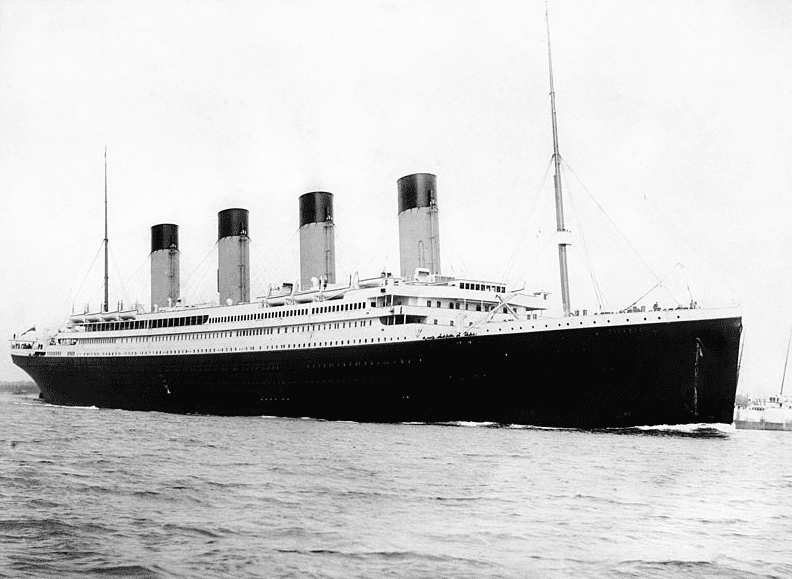 Make sure to read our other blog articles about the Titanic. (1) “The Wreck of the Titan: Or, Futility,” Wikipedia (https://en.wikipedia.org/wiki/The_Wreck_of_the_Titan:_Or,_Futility: accessed 11 April 2019). (2) “Chinese Exclusion Act,” History (https://www.history.com/topics/immigration/chinese-exclusion-act-1882: accessed 11 April 2019). (3) “How six Chinese men survived the Titanic disaster…,” South China Morning Post (https://www.scmp.com/culture/film-tv/article/2141549/how-six-chinese-men-survived-titanic-disaster-and-racist-us-federal: accessed 11 April 2019). (4) “Masabumi Hosono,” Wikipedia (https://en.wikipedia.org/wiki/Masabumi_Hosono: accessed 11 April 2019). (5) Miss Dorothy Winifred Gibson, “Encyclopedia Titanica (https://www.encyclopedia-titanica.org/titanic-survivor/dorothy-gibson.html: accessed 11 April 2019). (6) “Saved from the Titanic,” Wikipedia (https://en.wikipedia.org/wiki/Saved_from_the_Titanic: accessed 11 April 2019).